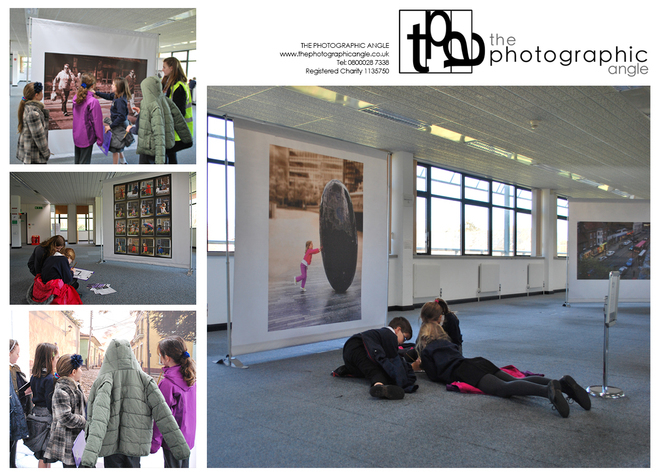 In February 2015, The Photographic Angle (TPA) welcomed 60 excited children from Clyst St.Mary Primary School to visit the popular Streetscapes exhibition in Exeter. The exhibition, which includes 150 large scale prints, is host to photographs taken in cities around the world. The photographs are a mix of cleverly composed cityscapes and stunning architecture and include some impressive candid shots. As the students wandered around the exhibition, they discussed their favourite images and photographers’ styles throughout the collection. The children were guided through by TPA’s Education Officer, Helen Marshall, using a specially designed Education Pack that helped the children to learn about the different features in the photographs. The children also took part in a scavenger hunt that required them to identify photographs that contained examples of composition and use of colour. There was also an exercise where they were able to fill in the gaps with storytelling images, proving that a picture really is worth a thousand words! The children, who were researching ideas for their project on local architecture and a photography competition, had both an enjoyable but also an educational experience. Their time at the exhibition provided them with plenty of ideas on how to capture their subject and make their photographs more interesting. As they left, many of them were eagerly making plans to get snapping on new projects of their own, feeling inspired by their experience. “I like the colours and it’s cool how it looks like the girl is pushing the egg” Freya, year 4/5.